As you may have figured out by now, I love Italian culture! Being of Italian descent, I have grown up surrounded by not only the culture but the language as well. Through exposure to the language at home and formal study of it at school, my passion and fascination of the language have grown over the years. I'm excited to announce that they have now led me to introduce you to a new series here on Viva la Dolce entitled, "VLD Italian 101." In this series, I would like to offer you a chance to learn about Italian language and culture through exposure to popular terminology and expressions, including the famous "proverbi" (proverbs). Speaking of which... the series kicks off right now with a famous proverb that teaches us how to stay young! 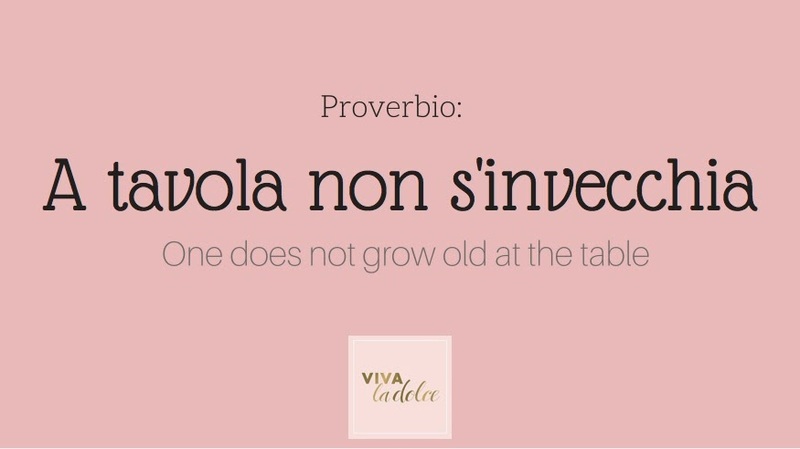 The above proverb, or proverbio, "a tavola non s'invecchià" literally means, "one does not grow old at the table." This popular saying refers to the Italian value of sharing meals together, and how this practice enriches our lives. After the recent Easter holiday, I thought this was most appropriate! For Italians, sharing a meal is like sharing one's heart. It is no secret that Italian's take pride in creating delicious meals and feeding those they love. It makes sense then that one of the most important traditions in Italian culture is family mealtime at the dinner table. The table is the place where stories are told, important matters are discussed and sometimes, even a little bit of music and dancing occurs! Overall, it is a wonderful spectacle and a place where memories are created. Italian meals can last hours, but it is this slow, luxurious indulgence in time which makes the sharing at the "tavola" all that more special. This proverb reminds us that as you spend time with those you love around a table with good food and drink, you are not wasting away hours of your life but instead, are adding value and substance to them. The time spent leaves your soul rejuvenated, your heart full and your tummy satisfied. I'm looking forward to my next family gathering! Hope you are too! Love this new series with the proverbi!